It was 4:00 am. 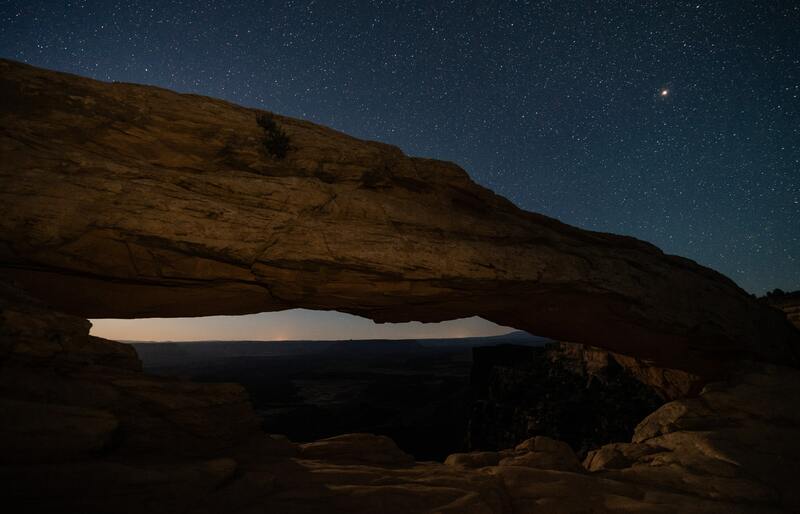 The Milky Way made a gigantic arch over the Mesa Arch in the Canyonlands National Park in Utah. I had come here two hours before the sunrise. I cycled in the dark while looking at the crescent moon above the horizon and smiling at it. 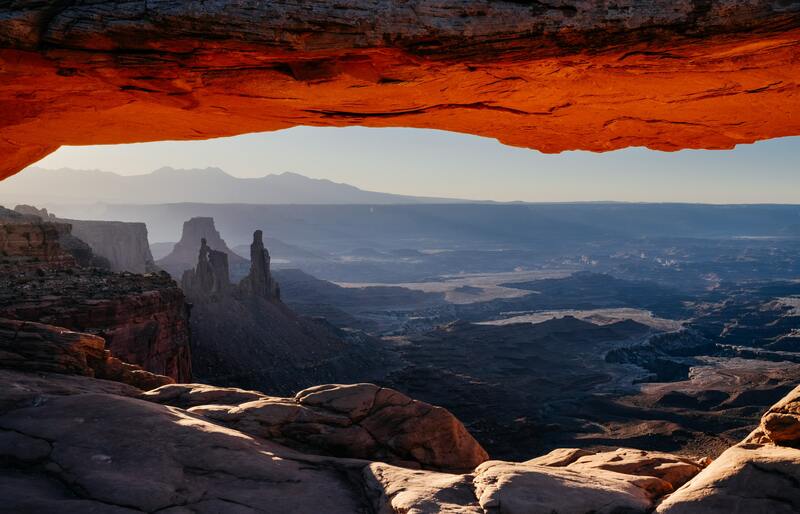 When I arrived at the Mesa Arch, I found myself alone, exactly why I had come here so early. I let my eyes adjust to the dark and then set up the camera on the tripod. The air was still. The arch held a deafening silence in the dark. As I began taking pictures of the Milky Way over the Mesa Arch, the silence was broken with the sound of something dropping on the ground behind me. I turned my headlamp on and looked around, but there was nothing. Everything was stationary. No animals. No humans. I thought maybe, something from the tree fell down and then resumed taking pictures again. After a couple of minutes, again I heard the sound of something falling nearby. The trees were still, with no seedpods or fruits on them whatsoever. It was a distinct sound of rocks (a size of an inch or two) dropping on the ground and rolling. It was puzzling to me where these rocks were dropping from. There were no vertical cliffs around from where the rocks could have fallen so close to me. I got alert and monitored the area closely with my headlamp on, but couldn’t see anything happening. As I turned my back to take pictures, I heard the same sound again, this time, two rocks dropping. It felt as if the rocks were being thrown in my direction, though nothing hit me. It kept going on for a while. The moment, I would look away, I would hear rocks dropping behind me. I stopped taking pictures, backed off and stood close to the wall of the arch. I kept my eyes peeled for a few minutes. Suddenly I heard someone yelling at me—I immediately looked to the right—my headlamp adjusted itself to full intensity—my hands clasped the camera as if it was my only weapon of defence—and my eyes focused in the distance. Just for a brief moment, I saw a white figure standing by a giant boulder. The moment the light reflected off it, and before I could make up what the figure exactly looked like, it moved behind the rock, but only partially. I could still see a part of it for a good few seconds. “Someone is here, maybe playing a prank to me?” I thought to myself. “Hey you, I can see you. Stop pranking me!” I shouted. In return, I could only hear my own echo. I kept my eyes on it. After a second or two, the figure disappeared behind the rock. “I know you are there. Stop doing this. Come here, let’s take pictures!” I tried to be funny despite being frightened. But nothing happened. I left the camera on the ground and scrambled towards where I thought someone was hiding. I took me only a few seconds to get to there, but there was no one in this place, only rocks and desert plants. I I stood there for a while and held my breath but couldn’t see or hear anyone fleeing. Over the course of last three and half years during my bicycle travels, I have spent many nights in the wilderness, slept in all sorts of abandoned houses and ghost towns, but nothing like this had ever happened to me before. I am not someone who believes in ghosts either. Maybe someone was pranking. But who would travel to a remote place like this at this time of the night to prank someone? Maybe it was a coyote? but they are not able to throw rocks and yell like people! It was spine-chilling. For the next hour, I didn’t take a single picture. I kept my headlight on and surveilled the area all the time, looking left and right. Nothing happened after that. 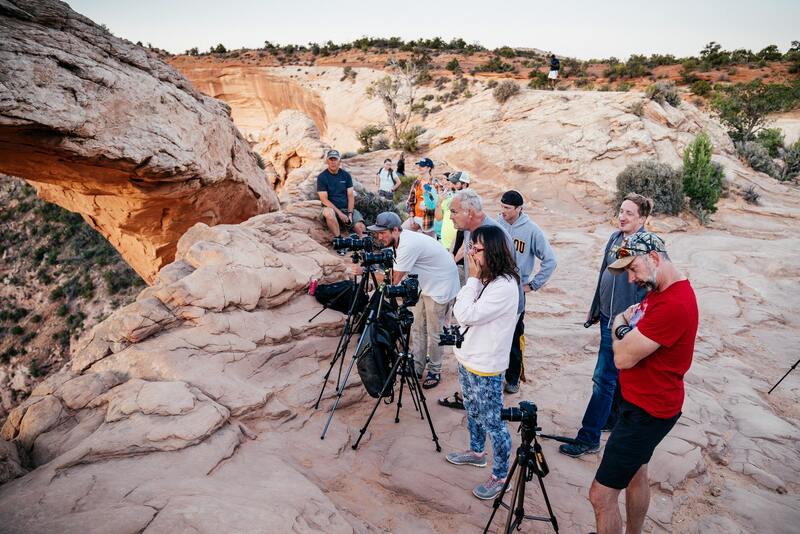 We three assumed our positions next to the arch and set up the cameras on tripods. More photographers came. When the sun rose up from the horizon at 6:00 am, I witnessed one of the most fascinating sunrises during this trip. 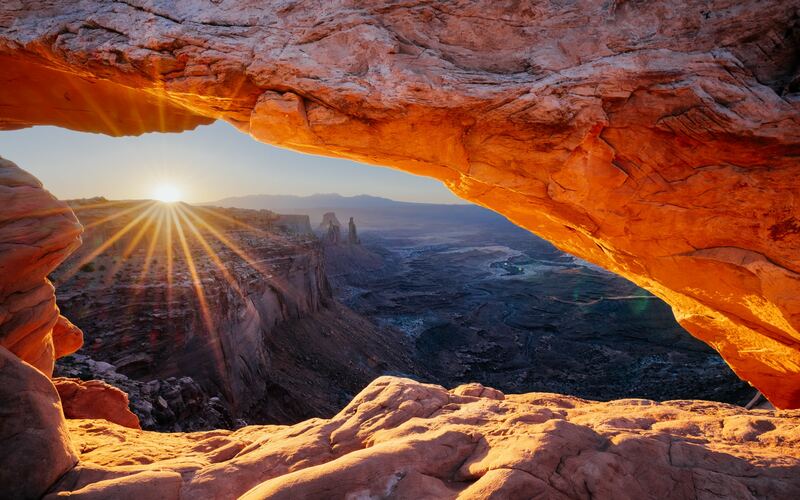 The bottom of the arch glowed red in the morning light as if it was on fire. I took 600 shots of the sunrise, but that incident kept coming back to my mind. Once in a while, I would stop for a second and turn around to see the boulder where I had seen a white figure a while ago. Could it be that it was indeed the spirit of an American Indian? For most Indian people, the land is an essential component of their spirituality and considered sacred. Maybe the spirits were here to protect this place? Or was it Coyote, a trickster figure in American Indian culture. According to one story, when Earth-Initiate was creating the first Man and the First Woman, Coyote tried to do the same thing, but started laughing and made a mess of it. Earth-Initiate admonished him and said Coyote could have done better had he not laughed. Coyote replied that he had not laughed at all, thus telling the world’s first lie! Most people who come to Mesa Arch are going to remember its fantastic sunrise forever, but my reasons would be different. Whether it was an Indian spirit or a coyote, it scared the hell out of me! And unlike Coyote, I am not lying! Previous Post Pain Is Not Where My Journey Ends! Next Post Beginning and End Of The Time! Your photos are indulging mesmerizing and pure gold! I wish I had at least one as such while I was doing Seattle to DC on a tandem!